Considered the restaurant capital of Montana, Red Lodge has a wide array of dining options from casual and formal dining to fast food and pizza. 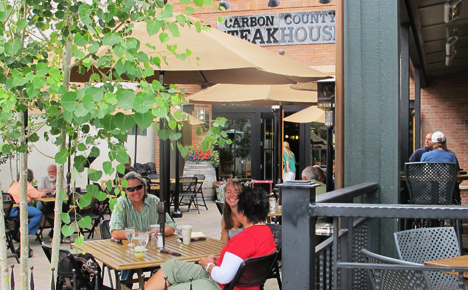 Many restaurants in Red Lodge are located in beautiful historic settings. City Bakery. 104 S. Broadway, Red Lodge, MT 59068. Phone: 406-446-2100. City Brew. 616 N. Broadway, Red Lodge, MT 59068. Phone: 406-446-1942. Coffee Factory Roasters. 6 1/2 S. Broadway, Red Lodge, MT 59068. Phone: 406-446-3200. Starbucks Coffee Bar at Bridge Creek. 116 S. Broadway, Red Lodge, MT 59068. Phone: 406-446-9900. Subway. 609 N. Broadway, Red Lodge, MT 59068. Phone: 406-446-4400. Pizano's Pizza. 224 S. Broadway, Red Lodge, MT 59068. Phone: 406-446-4444. Bull & Bear Saloon & Casino. 17 N. Broadway Avenue, Red Lodge, MT 59068. Phone: 406-446-3777. Foster and Logan's Pub & Grill. 17 S. Broadway, Red Lodge, MT 59068. Phone: 406-446-9080. Natali's Front Bar. 115 S. Broadway, Red Lodge, MT 59068. Phone: 406-446-3333. The Pub at The Pollard. 2 N. Broadway, Red Lodge, MT 59068. Phone: 406-446-0001; Toll-free: 1-800-765-5273. Red Lodge Ales. 1445 N. Broadway, Red Lodge, MT 59068. Phone: 406-446-4607. Bogart's. 11 N. Broadway Avenue, Red Lodge, MT 59068. Phone: 406-446-1784. Café Regis. 501 S. Word, Red Lodge, MT 59068. Phone: 406-446-1941. Carbon County Steakhouse. 121 S. Broadway, Red Lodge, MT 59068. Phone: 406-446-4025. China Garden. 202 S. Broadway, Red Lodge, MT 59068. Phone: 406-446-9909. Local Yokel Mobile Restaurant. 213 North Broadway Avenue, Red Lodge, MT 59068. Phone: 406-425-3137. Old Piney Dell Restaurant. Rock Creek Resort - 6380 US Highway 212 S, Red Lodge, MT 59068. Phone: 406-446-1196. Prindy's Place. 407 S. Broadway, Red Lodge, MT 59068. Phone: 406-446-0225. Red Box Car. 1300 S. Broadway, Red Lodge, MT 59068. Phone: 406-446-2152. Red Lodge Café. 16 S. Broadway Avenue, Red Lodge, MT 59068. Phone: 406-446-1619. Red Lodge Mountain Resort. 305 Ski Run Road, Red Lodge, MT 59068. Phone: 406-446-2610; Toll-free: 1-800-444-8977. Twin Elk. Rock Creek Resort - 6380 US Highway 212 S, Red Lodge, MT 59068. Phone: 406-446-3121. Vintage One Bistro. The Pollard - 2 N. Broadway, Red Lodge, MT 59068. Phone: 406-446-0001; Toll-free: 1-800-765-5273. Babcock & Miles. 105 W. 12th Street, Red Lodge, MT 59068. Phone: 406-446-1796. Montana Candy Emporium. 7 S. Broadway Avenue, Red Lodge, MT 59068. Phone: 406-446-1119.